We all dream of having a luxury spa and pool house in our own home. Wouldn’t it be great to be able to relax in the hot tub or soak in some heat in the sauna? Well, thanks to the awesomeness of infrared technology you can grab yourself the best two person sauna on the market and relax in your own home for a lot less than you might think. You might even benefit from sauna weight loss. Interested? Then read on. I myself have always loved to take some down time in the sauna at my local gym. Then one day I was talking to a friend who said he had just had one installed in his house. My first thought was where the heck did you put it and didn’t it cost you a fortune? This guy lives in a small house and he’s not exactly loaded. What really surprised me was the 2 person sauna cost him just over $1000. It fit in a tiny space near the back of his house and it was costing him just a few dollars a month to run it. He uses it every morning after his workout and he said he couldn’t believe the difference in a few short weeks. He felt much healthier and more relaxed. When I saw him it looked like he had just come back from a long relaxing holiday in the sun. Anyway, that was enough to convince me so I jumped onto Amazon and ordered myself up a 2 person infrared sauna. Just so you know I didn’t just grab the first one I saw, I did my research. So I put together some details from what I found below so you can save yourself some time and get to the fun part. 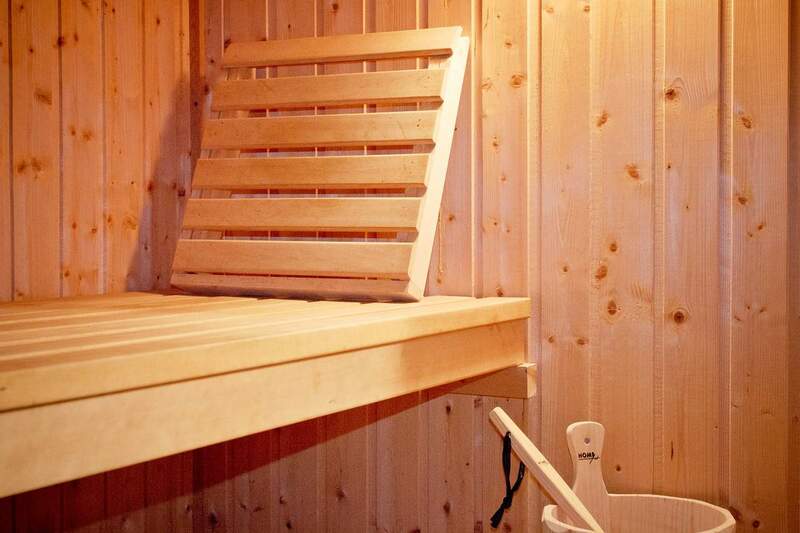 You could be sitting in your new sauna in no time. First up most models in this price range will require assembly. If you want a pre-assembled high-end sauna then you should consider contacting a contractor. That’s going to cost you a small fortune and take some time. The assembly in most models is not advanced. If you have someone to help you out, then two of you can have it out of the box and ready to go in a couple of hours. They come with instructions and don’t require any advanced tools or equipment. If you are completely allergic to diy then get a family member or friend to take the lead. With most models the structure needs to go together in the way shown but you do have some customizable options. You can choose things like where to put the towel racks, the best spot for the cup holders and so on. These are only little details but having them the way you want makes it all the better when it’s your own private sauna. In general, it takes around thirty to forty-five minutes for an infrared sauna to get up to full temperature. What I like to do it switch it on, go do my workout and then it’s ready when I am. I have also used it with a plug in timer so I can have it set before I get home from work which I really like. Why a two person Sauna? So if it’s just for you why do I keep mentioned a two person Sauna? Well first of all my wife likes to use it too. Sometimes we both like to kick back in there after work. But the really big reason is much more selfish and that’s so I can relax properly and enjoy the space. What do I mean? Well, let me explain. Most portable saunas or one person saunas are small. And I don’t mean that in a hey it’s easy to store and doesn’t take up half my house kind of way. Basically, there is enough room for you to either sit or stand in the sauna and that’s it. I’ve tried that and while the heat is still nice you can’t really relax. Not properly. My advice is, get a two person sauna and use the space to lounge in. You can lay back and get the full benefit of the heat while completely relaxed. What’s more, it doesn’t even that up that much additional space or use much more power so apart from the little bit of extra cost when you’re buying it there is really no downside. Its also much easier and quicker to assemble then its larger competitors like the three and four person models and hey when do you really need that much space. Plus who ahs that kind of spare room in their home anyway. How does a 2 person Sauna work? Most 2 person saunas are Infrared. This is now the case with most models simply because they heat up so much faster than the older style ceramic options which came with tubes and all sorts of maintenance issues. The panels are also quite large so they give a nice even heat rather than leaving cold spots which is great. The infrared also makes the running cost a lot lower due to its high-efficiency output, almost zero maintenance, and easy setup. It’s no secret that saunas are known for there health benefits. Some of the main ones include helping to aid recovery from muscle pain and even joint pain. This can be great for someone suffering from arthritis or damage to joints. Other benefits include increasing blood flow and circulation, reducing water retention and helping to detox the body. 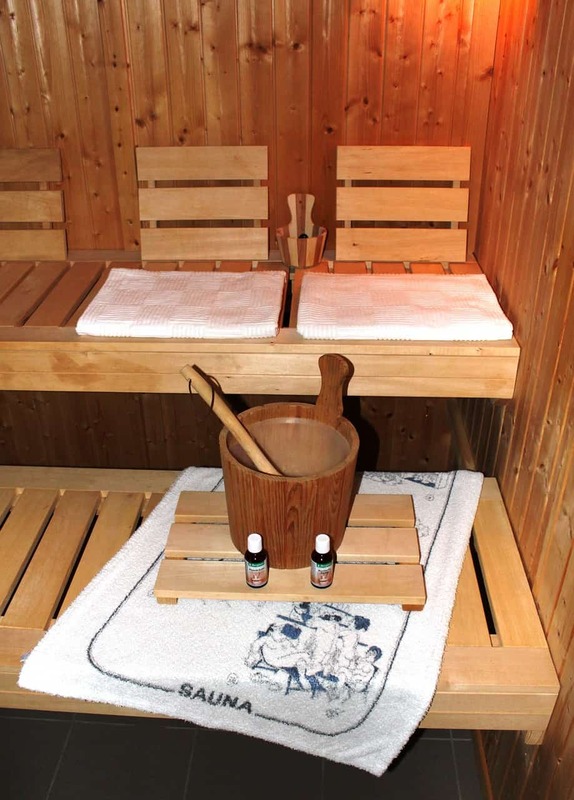 More recently there has been a lot of research into sauna weight loss benefits. While I’m not sure about this claim if it helps then hey, why not! So now you know why I love my Sauna and all the benefits it brings. Time to check out some options that might work for you. Take a look below. 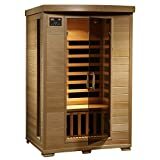 The JNH Lifestyles 2 person Far Infrared Sauna is both the top selling and top rated Sauna on Amazon. It has an almost perfect 4.8 out of 5 star rating from nearly one thousand buyers which is hard to argue with. I want to let the cat out of the bag here and say that this is the one I bought myself and I love it. I get it heated up, put my favorite music on through the built-in speakers and lay back and enjoy the heat. Overall this model is definitely our top pick and the best value for money. It’s not the most top of the range sauna on the market but it is an awful lot of Sauna for the price. It cost me a little over $1300 but it’s currently available on Amazon for just under $1100 so grab it while the price is low. 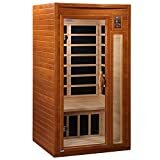 The 2 person Hemlock Deluxe Infrared Sauna is the next option with once again an impressive 4.5 out of 5 stars from existing buyers. Although this is from a much smaller sample of buyers. The feedback is good. The hemlock comes in at number two on our list as it ran a close race with the JNH Lifestyle. It’s a good product but the higher price and lower output lost it some points. The Hemlock is still a great option. The length of time needed to reach a suitable temperature was mostly what we didn’t like. The Dynamic Saunas Amz-dyn barcelona 1-2 person Far Infrared Sauna is out last sauna model review. It comes in with the lowest yet still impressive buyer rating of 4.3 out of 5 stars. While it’s actually the cheapest of the three 2 person saunas featured here there is a reason for that. As you can see from the name it says 1-2 person Sauna. In my opinion this is a bit of a stretch. While it is bigger than some of the other one person saunas on the market it is not really big enough for two people to enjoy. So if you’re looking for a smaller single person sauna this might be for you. Otherwise consider the options above. Most of all enjoy your new sauna and some time to yourself to relax.